Scampi from Australia are the sweetest in the world. Scampi from elsewhere such as Mozambique are simply incomparable. Scarcely available in Hong Kong which is why they are a pure delicacy from Down Under but don't get them confused with the more commonly available spot prawns or scampi from other parts of the world. These scampi are packed and snap frozen at -40°C on board a purpose built scampi trawler. 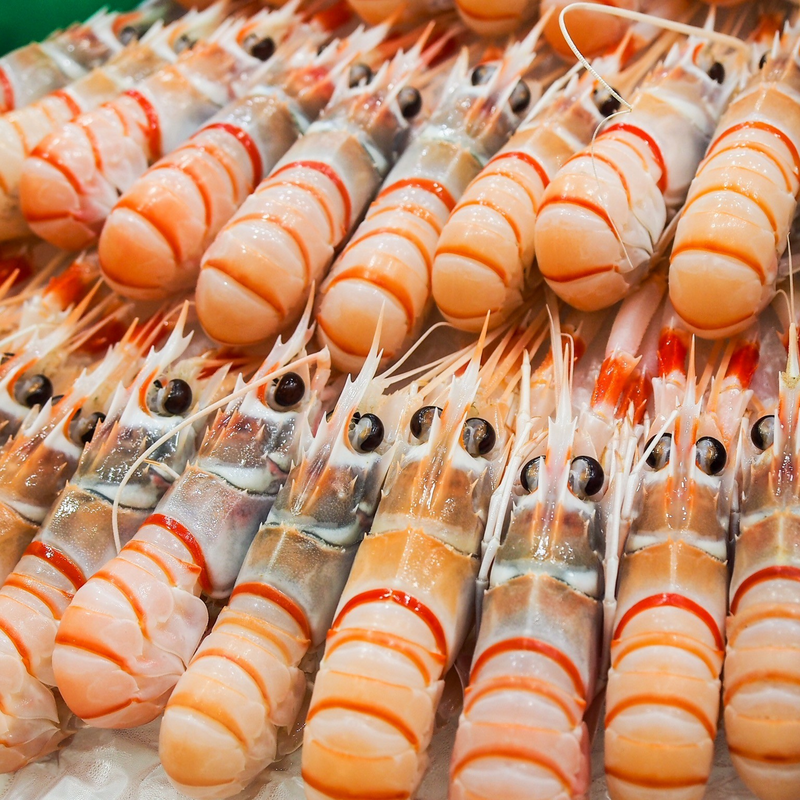 The care the producers take to catch, pack and freeze these scampi result in a Premium Sashimi Grade product.They would be excellent for BBQs as there is not much need for seasoning since their original taste is already sweet and flavoursome enough. Note that they are 100% natural, no hormones or antibiotics. Wild caught at deep sea, up to 400m, so one of the deepest scampi in the world. There are around 5 to 7 scampi in a box. Some Japanese restaurants use scampi head in soups to add extra flavour, for example in miso soup (so you can eat the scampi as sashimi and use the head part for soup). To defrost, simply remove the number you need and place them in cool water for 15 to 20 minutes. Scampi from Australia are the sweetest in the world. Scampi from elsewhere such as Mozambique are simply incomparable. Scarcely available in Hong Kong which is why they are a pure delicacy from Down Under but don't get them confused with the more commonly available spot prawns or scampi from other parts of the world. These scampi are packed and snap frozen at -40°C on board a purpose built scampi trawler. The care the producers take to catch, pack and freeze these scampi result in a Premium Sashimi Grade product.They would be excellent for BBQs as there is not much need for seasoning since their original taste is already sweet and flavoursome enough. Note that they are 100% natural, no hormones or antibiotics. Wild caught at deep sea, up to 400m, so one of the deepest scampi in the world. There are around 5 to 7 scampi in a box. Some Japanese restaurants use scampi head in soups to add extra flavour, for example in miso soup (so you can eat the scampi as sashimi and use the head part for soup). To defrost, simply remove the number you need and place them in cool water for 15 to 20 minutes. Weights listed are only approximate and may have a +/-10% variance (however, this usually means the item weighs a bit more than the listed weight). Please note that the pictures shown are for reference only and may not be an exact representation of the product. Currently, unless specified otherwise, all our meats, seafood and vegetable items come raw and frozen.